Here’s something for the MOTHER folks out there. 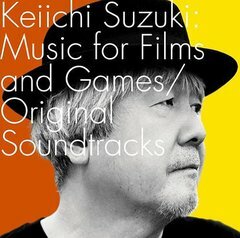 The “Smiles and Tears” track on the “Keiichi Suzuki:Music for Films and Games/Original Soundtracks” album is sung using lyrics written by me. I did a quick look, and apparently this is a new album that’s being released in a few days, which is why Itoi mentioned it. If you’re interested in adding it to your collection, it’s available for pre-order at Play-Asia. I don’t have a full track list of what’s on the album, but most of the music I’ve heard of Keiichi Suzuki sounds really cool, so I might have to check it out myself! :O This is amazing. It’s a 2CD set with a TON of MOTHER music! Oh cool! Has there ever been an offical version with the lyrics? Because I’ve only heard a few vocaloid versions that are all slightly different. I think this might be the first official version with lyrics, actually. Hmm… I’ve never heard of Etsuko Yakushinaru or Soutaiseiriron (Sōtaisei Riron)… Now I’m off to investigate!! I’m sure it’ll be great, but I’m curious as to how it might sound. This is really cool, I wonder if all the Mother tracks will be new recordings or just the versions from the MOTHER 1+2 CD… anyway, knowing that it’ll include a sung version of Smiles and Tears makes me want to get this for sure. Love Suzuki’s music. Can’t wait to order the CD! They cannot only post more per tweet, they also tend to post more often than anyone else I seem to be following. Itoi and Aoki both have added quite a wall of text since I’ve been subscribed to their tweets. I’m lucky to have noticed this one when I did. Oh, yes!! Wisdom of the World! My favorite song in MOTHER!! A wilfur! Saturn Valley and Twoson are in there too! Oh, Keiichi, that scruffy goatee and cropped blond hair is so charming. It appears that SMILES AND TEARS 2010 is available as a ringtone in Japan. This site has at least six different version which can be found if you search for “SMILES AND TEARS” and select the second search option, 楽曲名.